"It is true that a picture can speak 1000 words . A Life changing experience is happening for me right now - My father Clint took me to see Kiss back in January 1978 at the Chicago Stadium on a cold winters night. I was just 14 years old and my father Clint was 51 years old. That experience with my father is one of my top five life experiences of all time. Flash Forward now to August 16 2014 @ Tinley Park Illinois 8/16/14 Kiss show. 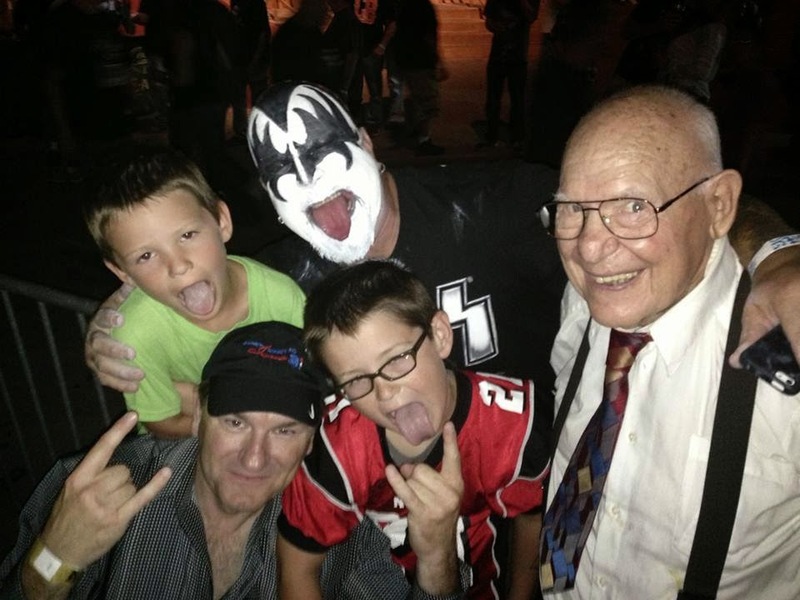 I am now 51 years old taking my sons to see Kiss along with my father who is now almost 90 years old. As I am watching this concert with my father and children I have tears rolling down my face. This is the perfect utopian moment and it is a perfect Circle. People have come up from the time that we've arrived at the show high-fiving my father Clint- hugging him and loving him. They are amazed at our story. Not only was my father the oldest person in attendance but was the only person wearing a tie and suspenders. God is good! — with Clint Garrett at First Midwest Bank Amphitheatre."